Lithuania issued this stamp Jan. 7 to commemorate the 500th anniversary of the Protestant Reformation, which started with Martin Luther nailing 95 theses to the door of the church in Wittenberg, Germany. A German stamp issued in January honors Martin Luther’s translation of the Bible in German. In April, Germany will participate in a joint issue with Brazil to mark the 500th anniversary of the Reformation. Vatican City will be among the postal administrations commemorating the 500th anniversary of the Protestant Reformation. The design for the Vatican stamp hasn’t been revealed yet, but the subject is listed on its 2017 stamp program, along with stamps for Christmas, Easter, saints, and popes. The Reformation began Oct. 31, 1517, when German scholar and monk Martin Luther nailed 95 theses to the door of the Castle Church in Wittenberg, Germany. This action eventually led not only to the rise of Protestantism but also to the excommunication of Luther from the Catholic Church in 1521. In the spirit of ecumenism (promoting unity among Christian churches), the Reformation is being celebrated around the world, including the Vatican. 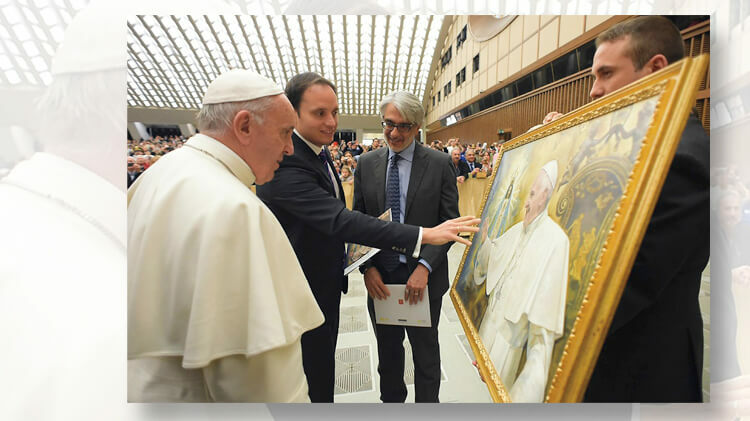 Pope Francis meets artist whose painting inspired a Vatican stamp: A photographer captured the philatelic moment at the Paul VI Audience Hall in the Vatican. In addition to Vatican City, other postal administrations will honor the 500th anniversary of the Reformation on stamps. Lithuania apparently was the first, issuing its commemorative stamp Jan. 7. The €0.39 stamp includes a portrait of Luther in the foreground and the Wittenberg church in the background. The first-day cancel shows the nailing of the theses to the church’s door. Germany will commemorate the 500th anniversary of the Reformation as part of an April 13 joint issue with Brazil. In the meantime, a €2.60 stamp was issued Jan. 2 honoring Luther’s German-language translation of the Bible. The design shows the printed work with Luther’s handwritten notations. The new-issue announcement for this German stamp also mentions the Reformation jubilee. In addition to the stamp for the Protestant Reformation, Vatican City’s 2017 program includes stamps honoring the following anniversaries: 1,950th anniversary of the martyrdom of St. Peter and St. Paul, 600th anniversary of the Diocese of Samogitia (a joint issue with Lithuania), 450th birth anniversary of St. Frances de Sales, 350th death anniversaries of Pope Alexander VII and architect Francesco Borromini, and the 200th anniversary of the foundation of the Institute of the Marist School Brothers. Also to be commemorated on 2017 stamps will be the centenaries of the apparitions at Fatima, Portugal; the birth of Cardinal Domenico Bartolucci, director of the Sistine Chapel Choir; and the death of St. Francesca Saverio Cabrini, patroness of immigrants. Also on the 2017 program are the 50th anniversaries of the encyclical letter Populorum Progressio by Pope Paul VI, and the death of priest and educator Lorenzo Milani. Stamps will mark the 2017 pontificate of Pope Francis and his apostolic journeys in 2016. Another issue will celebrate the 90th birthday of Pope Benedict XVI. Rounding out the Vatican’s 2017 stamp program are stamps for Easter, Christmas (a joint issue with Monaco), and the Europa theme of castles. The Vatican City’s stamp program for 2017 does not include issue dates. Buy the NEW Scott Vatican 2016 Stamp Supplement #49 direct from AmosAdvantage.com & save! There are stamps paying tribute to Donald Trump as president, but they’re not from the U.S.